Maybe it was a factory mod or a depot mod perhaps? Could be. I'll leave it the way it is for now and perhaps try adding the components again later to see what happens. Maybe one of the SP-600 experts here would know. All that is left is to rewire the power supply and replace a few missing or modified wires in other sections of the receiver and I'll be ready for a test again. It'll be a while though since I still don't have the wire. I have wire, just not the wire that I want to use. I'll be doing my best to color code things correctly and all that. Even the modifications in this receiver used the correct color coded wires! 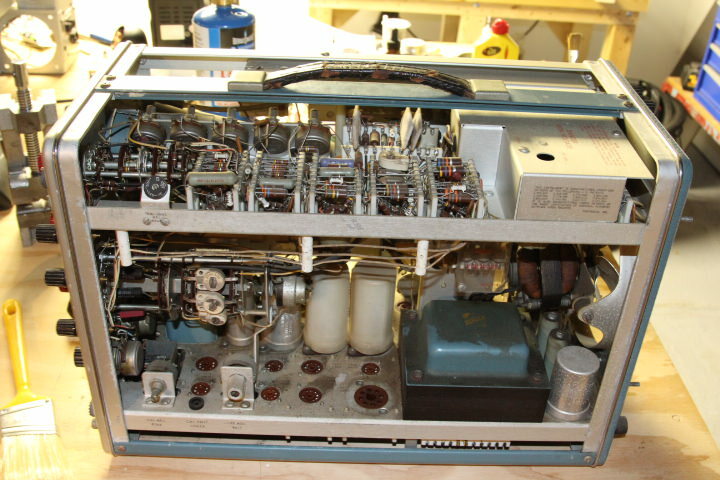 It's a greasy, dusty Tektronix 317 that is missing 30 tubes. But it's the most adorable little scope I've ever seen! And it's not very little. It's damn heavy! And it is seriously greasy on the inside. Either someone way over lubed the fan motor in it or it was used by a fry cook! Could have been used in some sort of automotive related shop. My guess is someone pulled the tubes and sold them to the audio crowd as if it uses any 6DJ8 tubes they are usually popular with the audio crowd. Just give the old girl a bath. That's what TEK did with them. Suggest you price a new set of tubes, before you spend any time on that scope. You may be able to get a newer, complete, working scope for the same price. That's true. 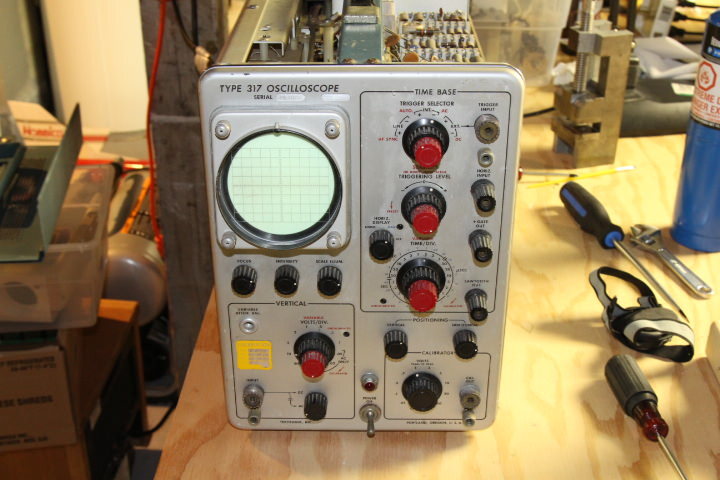 I know some of these old Tek scopes were sold with an automotive kit for use in garages. Could certainly have been used for that. Either way, the grease and dust seems to have kept the metal parts in good shape. Like a protective coating. It's not the first time I've run into a case like this. I'm so very wary of washing electronics that way, Mike. Dishwasher or wash tub. People seem to have good luck with that method, but regardless, there's a voice inside of me screaming "Don't do that!". Maybe I'll get over that fear some day! Chances are I have some of the tubes lying around here, Chuck. I've got a few hundred to dig through. If not, I have a buddy in BC who's currently in my debt. He's got thousands of tubes and I'm sure he could help me out. I'd like to get a few more old Tek scopes anyway. I like to have two of everything. Not out of greed, but rationality. These old beasts aren't made anymore and with the rising prices of tubes and parts, it seems better to build up an inventory now rather than later. Besides, when I buy a house, I won't have nearly as much money to put towards these things! I gotta ensure I have some projects to keep me busy. I'm getting pretty good about derailing my own threads, aren't I!? I have gone through a number of the older 500 series tube type lab grade scopes and the 317 is basically a smaller size relative that uses a fixed instead of plug-in vertical input. When one of these is dirty it is critical to clean up those beautiful porcelain with silver terminal strips properly or silver will migrate across the barriers between terminals much like what happens to some aging silver mica caps. You should also use silver bearing solder when doing repair work although a single soldering event with regular tin/lead per terminal shouldn't hurt anything. Tektronix generally packed a little roll of solder inside the case and my R556 was pristine on the inside and still had the solder in place. Depending upon its build date and past maintenance it may have a lot of paper type capacitors that will be leaky and in need of replacement. Another area deserving close scrutiny is the power section that supplies the CRT operating potential. This uses the rectified output of an RF oscillator allowing the use of very small filter capacitors (operating frequency is around 60 Khz.) and provides protection against HV faults because with any excessive load the oscillator stops and voltage output is lost. If the filter capacitors (often paper types) are at all leaky they will prevent the oscillator from working as will foreign material/grime buildup in this circuit. Do NOT wash this transformer with anything but good distilled water or the residue will kill it and only wash it as a last resort. My ZM-11 military R/L/C bridge uses a similar RF type power supply for testing electrolytic capacitors and this is a great feature because if a capacitor is excessively leaky or shorts instead of sparks and smoke the oscillator and voltage simply stop. Tektronix set the standard for technical writing in this era and both the operating and calibration instructions for these scopes are extremely well written and make most modern manuals look like the garbage that they are. One area that may try your patience is setting up the vertical delay line. The delay line allows the scope to display the triggering event for high speed events because it is inserted after the trigger pickoff and allows the sweep to be triggered and start running before the event itself is used to drive the vertical deflection plates. Calibration involves the use of a very good quality square wave generator and the delay line adjustable components are set so that the displayed event is also a square wave. Every adjustment will have an impact on its neighboring adjustments and there are a LOT of adjustments in the delay line usually requiring several iterations if it has been disturbed. If possible leave the delay line alone and if not take your time and don't get frustrated. 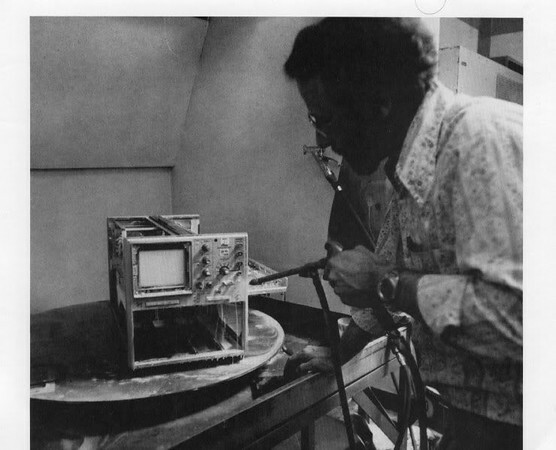 Later it was discovered coaxial cable could be used to create the delay line which often cut the calibration time by half or more for one of these scopes. Thanks for all the info, Rodger! I'll be sure to keep that all in mind when I get to working on the scope! And yeah, I can see how adjusting an L/C delay line like this could be quite tasking. There's gotta be at least 40 capacitors in this one! I've never done much work on oscilloscopes before, besides some basic stuff like replacing a few capacitors and cleaning switches. But I do so love a good CRT scope, so it's something I'd like to do more of. In SP-600 news, I've finally ordered proper military spec wire! Tin plated and everything! I also just bought a Heathkit SB-620 Panadapter so I'll be working on that after this radio. I'd like to use it with this radio if I can. I have no idea what frequency it is set up for or if it even works at all. I'll have to see when I get it. I probably won't have any updates to post until mid January. Until then, I hope you all have a good holiday season! I'm working on Christmas myself, but I prefer it that way. When you get to the SB-620 be sure to replace the 3 high voltage tubular capacitors in the high voltage supply, they are available from Mouser. Of course the regular power supply electrolytics should be replaced also. The transformer is the weak link in the SB-610 and SB-620, the fine wire HV winding in particular, so treat it gently and replacing those tubular filter caps is critical. Also make sure that the area around the intensity and focus pots is clean because these have HV across them and you want to avoid any leakage to ground through dust buildup on these. Murphy's law states that whatever IF you have the SB-620 will have components installed for a different IF. 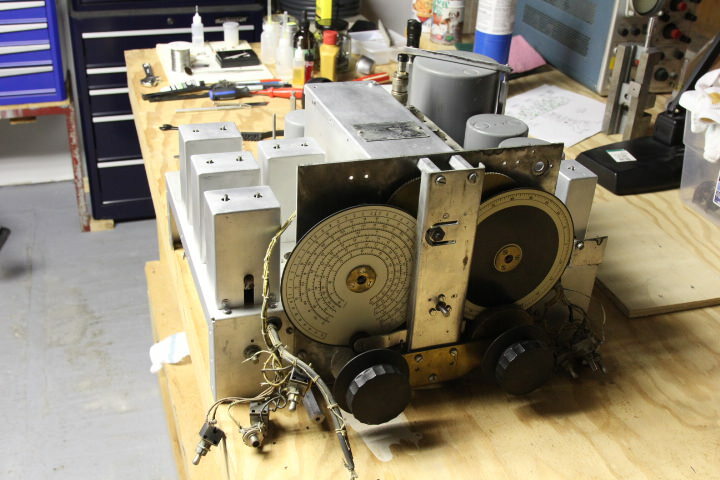 It was designed primarily for the Heathkit 3.395 Mhz. 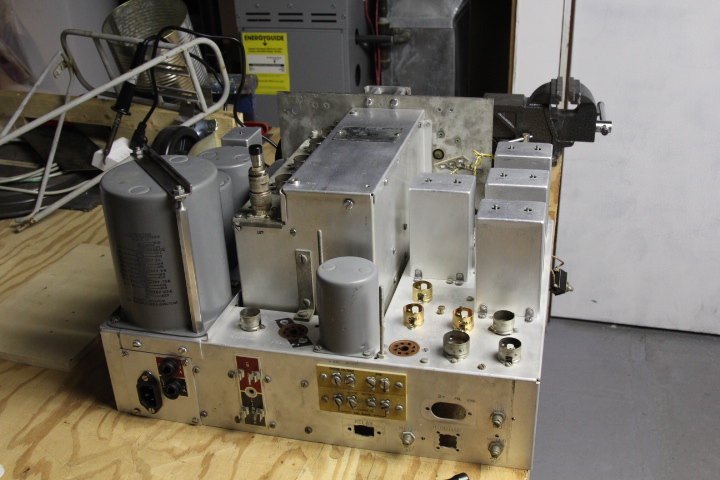 IF but included components and options for building it for the common 455 Khz. IF and also other common IF frequencies. The scanalyzer uses a tuned vertical amplifier with components chosen to provide a bandpass around the receiver IF frequency and the coil for the mixer oscillator is chosen based upon the input frequency. I have a list of coil data that is from one of the mailing lists and I think it used to be on Bama/edebris before the Heathkit manual dictator threatened them. Shoot me a PM if you need the coil data for the oscillator. With luck your SB-620 is already set up for 455 Khz. but if not an easier solution today might be to add an external broadband mixer circuit driven by an appropriate oscillator (crystal controlled or programmable) to convert to whatever IF the SB-620 is built for currently. Finding a used SB-620 where the owner kept all of the optional coils with it would be very unusual. The SB-620 is an updated version of the older HO-13 as the SB-610 is to the HO-10 and in a pinch you could probably steal a transformer out of one of these early versions and reconfigure it to power one of the later versions. Thanks for the info again, Rodger! I'll certainly make a thread about it when I get to working on it. I think I would definitely find you useful to have around when I do! I hope to find another one, in better or worse shape than this one depending on how this one is. It looks alright from the outside. Doesn't appear to have been modified or cannibalized. I like to have multiple pieces of the same equipment for when I need parts that are hard to come by. I have the schematic and the coil info as well as the calibration info. I'd like to get the rest of the manual but I have been unable to find it. I hear that an easy way to use the SB-620 without changing the coils is to switch it to the "spectrum analyzer" setting and supply an oscillator signal to the IF-Signal Generator jack that is the IF of the receiver + or - the IF of the SB-620. I may try going that route. Hard to say at the moment. Either way, I should be able to figure things out. I'll also set up the SP-600 IF output to work with the SB-620. I hear a wire coiled around the wire from the mixer plate along with a .01uf cap and a resistor of around 47K works well to isolate things. That or a very small capacitor directly connected to the mixer plate. I don't know about all that yet. I find there's not too much point in thinking about things a while ahead. I tend to forget them anyway. Well I hope everyone had a good holiday season and that you are all starting your 2018 off well! I have finally received my wire and have been working on the SP-600 a little. The wire struck me as a little thin when I first looked at it, but it's about the same as the original wire in the receiver. The insulation is thinner and without the fabric outer layer of course. It's 20 gauge, stranded, tin plated, 600v rated mil spec wire, so I feel like it's a good choice for this JAN quality radio! Also, the insulation is PTFE. It's a little harder to strip than what I'm used to, but my dwell time while soldering can be quite long and the insulation doesn't even seem to notice! I love that! Since receiving the wire, I have rewired the power supply. Hammarlund used both solid colors and colors with varying stripes, and while I only have solid orange, red, blue, green, white, brown, grey, yellow, violet, and black at least there is some semblance of color coding in my rewiring job. Here's an awkward pic of the power supply section. I changed the orientation of the turret board. It just seemed to fit better horizontally and made the rewiring more convenient. There are a few more wires to replace and the two large power resistors to install once I have put the side panels back on. One of the wires that I need to replace is from terminal 3 on the RF gain pot. It's supposed to run to terminal 6 on E13. That is what's shown on the wiring diagram. Yet it appears to have originally been connected somewhere near the IF section. I think there's only one explanation, the main chassis was originally wired for the 7 wire RF deck (or one of whatever AGC variations used this wiring difference). That theory is reinforced by the fact that there is a modern white wire running from terminal 13 of E17 to a terminal on T2 that would normally have been connected to the RF pot wire. It seems that the previous owner did their best to convert this receiver to a different type. It's not like it wasn't obvious before this revelation. I just hope that there aren't too many other differences in the wiring or different component values. It'll pay off to go through the tube socket resistance chart eventually and see what I come up with. If I can make this old girl sing in the end, then I can do anything! To the AGC modification, I modified my JX-17 AGC so it was like the JX-14 AGC. My understanding is that the JX-14 is "the" circuit to use with these receivers. Since you are referring to the "strip N lug" numbers I guess you have the TM for these receivers. If so you can readily review the differences between the two circuits. Glad to see you're back on the unit and making progress, these receivers are pretty darn good band cruisers, even though they have some stability problems at the higher frequencies. changed the mentioned Jx numbers as they were in error. Last edited by Mikeinkcmo on Jan Mon 15, 2018 1:32 pm, edited 1 time in total. I have a JX-17. Its almost all original except for three replaced BBODs and several 50 or 100 mA fuses added to protect against unpleasantness if a remaining BBOD goes. They are too beautiful to remove and work fine. AM/RTTY/digital modes of course. This includes the BCB. For people who claim the AGC does not work ... in what circumstances? I did the agc mod to my JX-17 and it is better. The problem with the stock agc from what i could tell is only apparent when receiving a strong station such as a local 50KW AM station a few miles from your location which tends to overload the front end and causes audible distortion. Of course ive also had it overload from my two tube broadcaster in the same room before the agc mod. The agc was done like it was because that's what worked best for diversity reception which the JX-17 was designed for. Personally id suggest replacing the rest of the caps asap before something does happen and takes something out before a fuse blows. I'm so very wary of washing electronics that way, Mike. Dishwasher or wash tub. People seem to have good luck with that method, but regardless, there's a voice inside of me screaming "Don't do that!". I started working in a cal lab in 1970. Every Tek scope that came in got washed just as shown in that picture. Most of the time they met all specs after they dried out. To the AGC modification, I modified my JX-17 AGC so it was like the JX-10 AGC. My understanding is that the JX-10 is "the" circuit to use with these receivers. From Andy Moorer's website: "Many people have asked me what is the difference between the "Diversity" receivers (The SP-600JX17) and all the other receivers. The diversity receivers look really cool because of the 3 red knobs on the front, but it is probably irrelevant for modern usage. In fact, the AGC structure, I feel, is not as good as the other receivers. 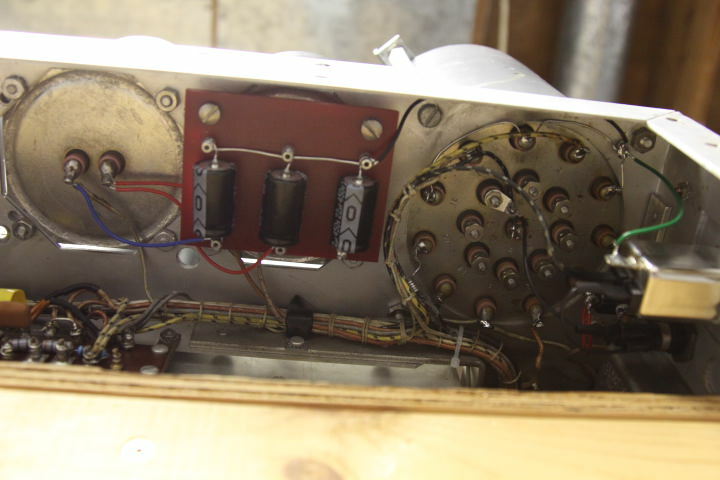 Among other things, they inject the AGC voltage into the 6BE6 first mixer tube. The 6BE6 is not really designed for variable-mu operation. They run the first two RF stages at a relatively high gain all the time. I think this causes the AGC to do wierd things. I feel these receivers overload much more easily on strong signals." Mike it's the JX-14 AGC that has the best AGC characteristics. That was the original info I sent you a while back.